I had been there many many years ago, actually on a school trip, and I remembered a few things and my memory kept telling "it's a beautiful city" without much detail. I knew I had to bring my Dutchy there. Actually, in 2016, while we were having another road trip in the Central/North of Portugal (in case you're curious then check here: BRAGA, GUIMARÃES, VILA REAL, COIMBRA) we had a bus layover in Viseu for 1 hour and it was enough to make an impression. At that moment, we agreed that on the next trip we had to stay longer. And so we did! 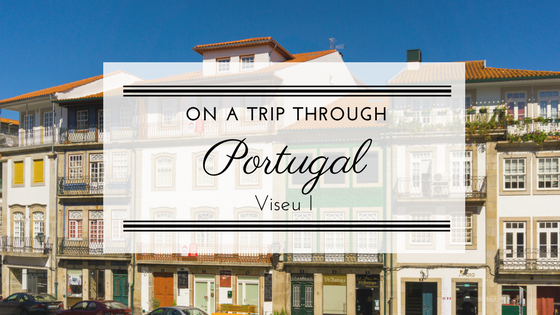 So, come along on our first day in VISEU. Viseu is a hilltop city and district capital in Central Portugal; situated in the Beira Alta between the mountain ranges of the Serra da Estrela and Serra do Caramulo. Casa da Sé was our small, cozy, charming, luxury and perfectly located hotel. We were both so astonished by how beautiful it was; once we got in, it felt like going back in time in a very nice way. The staff is amazing and it has great breakfast! Restaurant Colmeia, with nice terrace tables right next to the Sé's walls. Always very busy, but the food was good and with the friendly staff though not very caring, which I believe it was related to many customers. On this day, we walked approximately 11429steps, which makes a total of 8.17km! How did you like the first sights of Viseu? Mto bonito. Quero ir lá!!! Gorgeous! I enjoyed this virtual tour, everything is beautiful. I'm also loving the picture of the stairs (i know that out of all the photos that is the one i mention. Now i will have to add another destination to the travel list.